This past weekend featured the World Championship Time Trial and Road Races for men and women. This is a time of year where you might discover some up and coming talent. It is also a time to see if any of the old guard still have anything left in the tank to push for the coveted rainbow stripes that represent the World Champion. The racing is a bit different than usual since the teams are all based on nations rather than the usual trade teams in the pro tour. You get some unusual pairings working to set one another up to win the road race and wear the World Champion Jersey for the next 12 months. This year's winner, Philippe Gilbert, was supported by one of his primary rivals in the one day classics - Tom Boonen. Their strategy worked to perfection and Gilbert dropped all his rivals on the final climb up the famous Cauberg and taking the victory and bringing the World Championship home to Belgium for the 26th time. This past Friday was Grenache day, an up and coming red grape variety found around the world. In honor of Grenache Day and the surprises that can be found in the World Championship Road Races I opened a Grenache, Syrah, Mourvedre blend from Washington to take on a Cotes du Rhone. This matchup featured very little Southern Hospitality and a whole lot of Dirty South. The Nota Bene isn't wasting any time getting down to business. This bruiser is bringing the pain with a nose of dark loganberry, smoked meat, cracked pepper and candle wax. The palate is dark berries, menthol and cracked pepper that continues on to the finish with some sweet cherry bark notes. 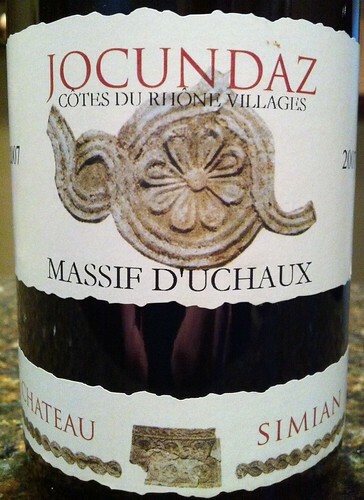 Jocundaz is getting in touch with its terroir with a funky earth and cranberry nose. The palate is full of tart cranberry, pepper, black tea and tobacco leaf with a sweet tart finish that includes some coffee notes. The Nota Bene is beefed up and ready to brawl while the Jocundaz is countering with complexity. This round was close with the Nota Bene bruiser taking the round. Nota Bene is evolving and changing styles to go head to head with the French Challenger. The nose is sweet dark fruit and dusty black tea. The palate is displaying dark fruit, pepper and black tea with a tart cracked pepper finish. Jocundaz isn't sitting still, bobbing and weaving looking for an opening and an opportunity to take down the bigger Luchador from Washington. The nose is showing dark berries with some barnyard funk, sandal wood and tobacco leaf. The palate is similar with dark fruit, spices and tobacco with menthol on the finish. This round goes to the Jocundaz. 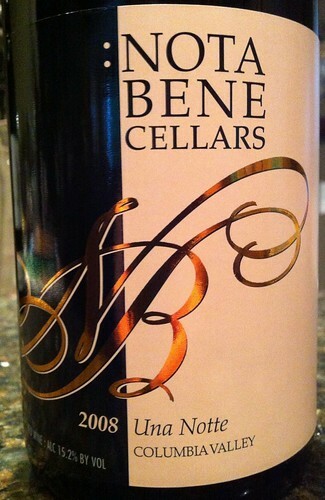 Nota Bene is big, dark and powerful with a nose featuring dark fruit, camp fire smoke and cracked pepper. The palate is dominated by dark fruit and spicy cracked pepper that evolves into a finish with tart spices and a bit of nuttiness. Jocundaz is switching up again with a nose of raspberry, black tea and spciy tobacco leaf. The palate is loaded with complex character of black tart tea, spicy tobacco leaf and medium red ripe berries with a finish featuring tart tea and sweet tobacco leaf. The final round also goes to Jocundaz. The Nota Bene Luchador gained strength throughout the match while Jocundaz matched the evolution gaining complexity through all three rounds and taking the victory. Both of these wines were very solid. The French Luchador from Ch. Simian delivered more complex flavors evolving over all three rounds. Three days after the match both of these Luchadors are standing tall and delivering the goods. That is some serious stamina! I give both of these wines an 89.